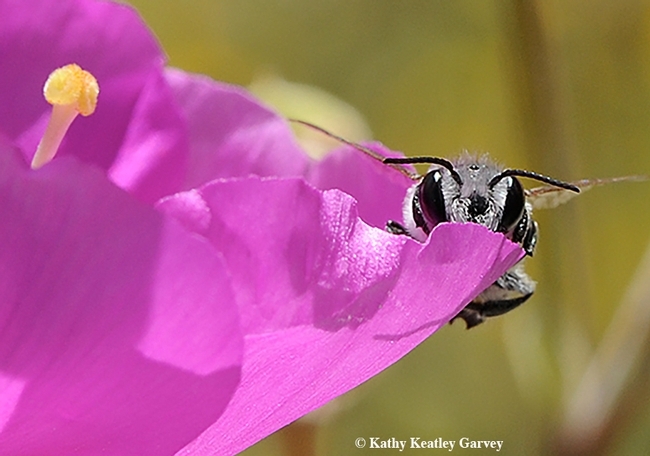 It's one of the most beautiful, incredible images of a leafcutter bee we've ever seen. 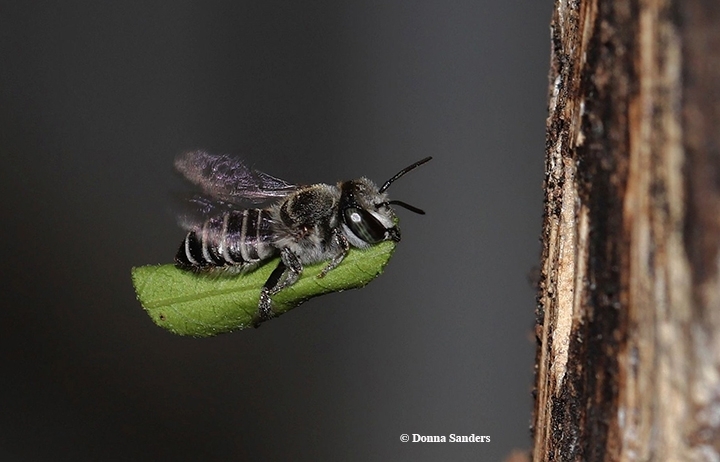 Talented macro insect photographer Donna Sanders of Emerald, Queensland, Australia, captured this spectacular photo (below) of a female leafcutter bee carrying a leaf segment back to her nest, a cavity in a tree trunk. She posted it on the Australian Native Bee Network Facebook page, where it drew some 80 raves and 36 shares--and deservedly so. You often see leafcutter bees in your garden, and you often see them in flight, but it's difficult to capture an image of a leafcutter bee in flight AND that's carrying a leaf segment. Her image reminds me of the 1880 painting, "Riding a Magic Carpet," by Viktor Vasnetsov. This takes patience, persistence and skill. And it takes your breath away. "We have lots of bee hotels around our yard," she told us. "This is just a section of a tree trunk with natural holes, probably from beetle boring." How did she capture this image? "I would sit there in the morning until late afternoon watching her carry pollen, then carry sections of leaf that she had cut out, back to her nest site. I did this over a couple of days sitting on my little stool, just waiting for her to fly toward the hole. It took many photos before I managed to get this shot, so when I checked it on the computer, I was so happy that I had finally captured what I have been aiming for." Leafcutter bees, Megachile spp., so named because they cut leaves and petals to line their nests, are smaller than honey bees--and much faster. They're easily recognizable by the black-white bands on their abdomen. Catching them in flight is a challenge. 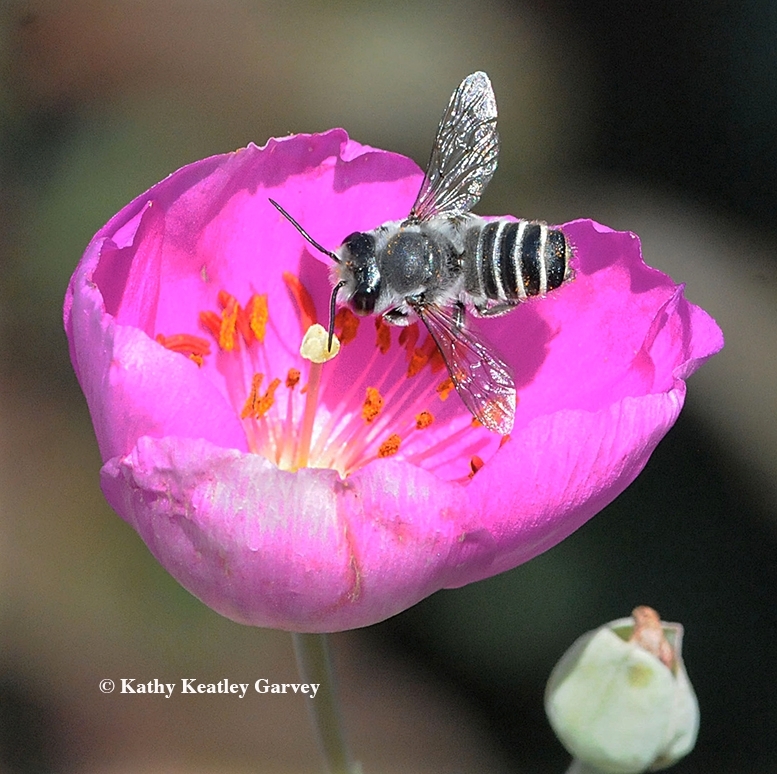 In our own pollinator garden in Vacaville, Calif., we've watched these native bees maneuver around honey bees, wool carder bees, carpenter bees, butterflies and assorted spiders. It's an obstacle course, to be sure. We've watched them cut holes in leaves. Perfectly round holes. Some Rosarians aren't fond of leafcutter bees because they cut holes in the leaves of their prize-winning roses. Our roses are a colorful part of our garden, but the pollinators take precedence! If American poet Gertrude Stein (1874-1946) had elevated bees, especially leafcutter bees--to the status of roses ("a rose is a rose is a rose")--would she had penned: "A leafcutter bee is a leafcutter bee is a leafcutter bee?" Or "A pollinator is a pollinator is a pollinator?" There's still time to register for the seventh annual International Pollinator Conference, set Wednesday, July 17 through Saturday, July 20 in the UC Davis Conference Center. 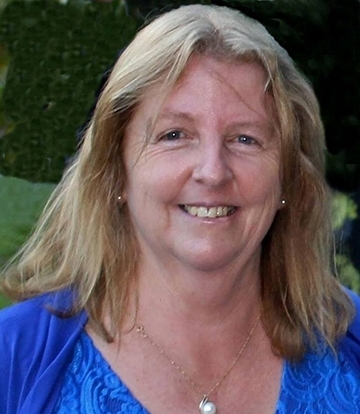 The conference, themed “Multidimensional Solutions to Current and Future Threats to Pollinator Health,” will cover a wide range of topics in pollinator research: from genomics to ecology and their application to land use and management; to breeding of managed bees; and to monitoring of global pollinator populations. Topics discussed will include recent research advances in the biology and health of pollinators, and their policy implications, according to the UC Davis Department of Entomology and Nematology co-chairs, Neal M. Williams, professor of entomology, and Elina Lastro Niño, Extension apiculturist. Keynote speakers are Christina Grozinger, distinguished professor of entomology and director of the Center for Pollinator Research, Pennsylvania State University, (the research center launched the annual pollinator conferences in 2012) and Lynn Dicks, Natural Environment Research Council (NERC) Research Fellow, School of Biological Sciences, University of East Anglia, England. You can learn more about the conference--and register--on the UC Davis Honey and Pollination Center website.